Eeek! Have you received a dreaded letter from your school that a student in your child’s class is infected with lice? If so, you’re likely quite concerned, as you should be. 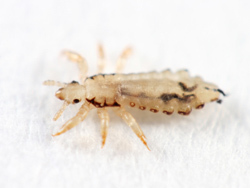 Lice can be extremely difficult to get rid of and often spread very easily. If you’re looking for someone to rid your home of lice, look no further than the Minnesota lice removal team at Eco Tech. With decades of pest control experience in the Twin Cities area, we’re confident that we can take care of your lice problem once and for all. Lice are becoming a major problem across America. A recent NY Post article indicated that there are up to 12 million lice infestations facing American kids each year. While lice can be treated on the affected individuals via a variety of over the counter medicines and shampoos, this doesn’t necessarily get rid of any lice that are in your home, or building. If your home, school or building has been exposed to lice, it may make sense to call your local Minnesota exterminator to provide lice removal services. A full service pest control company like Eco Tech can come out to your home or building and treat the interior and exterior to ensure that all of the lice have been exterminated. This way your lice problem will be gone for good. At Eco Tech, while our #1 goal is to rid your home or building of pests, we’re also focused on using less toxic chemicals to ensure your family members and even furry friends are not harmed by any of the products we use. We use a less toxic organic product line that is much safer than some of the pest control products our competitors use. At Eco Tech we understand that your pest control needs can happen at any time day or night. For this reason, we offer a 24/7 emergency line to ensure we’re always available in your time of need. Feel free to call us at 763-785-1414 day or night and we’ll do our best to respond to your Minnesota pest control needs immediately. Whether you’re dealing with lice or any other pest, we’re confident that we can help you restore your home or building to a pest free state.